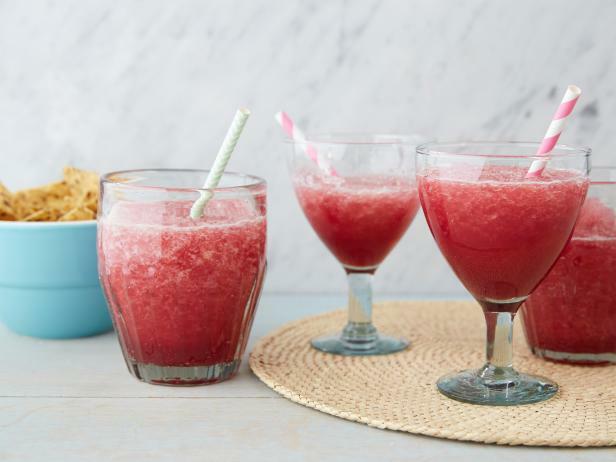 This cocktail is a blend of frozen sangria and frozen margarita; just spoon a few layers of each into a margarita glass and it's ready to sip. For the frozen margarita: Add to a blender the ice, tequila, orange liquor, lime juice and agave. Blend until combined, adding more ice to make thicker. Remove to a pitcher. For the frozen sangria: Add to a blender the ice, red wine, orange juice, lemon juice and agave. Blend until combined, adding more ice to make thicker. Remove to a pitcher. To serve: Spoon a layer of frozen margarita and then a layer of frozen sangria into a margarita glass and repeat to create layers. Best served with straws!